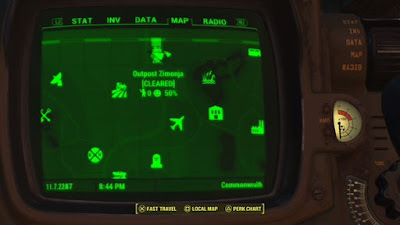 You’ll find Outpost Zimonja along the northernmost edges of the Commonwealth, a relatively short northeastern trek from Tenpines Bluff. The Outpost is more or less located beneath the highway that runs south towards Lexington. 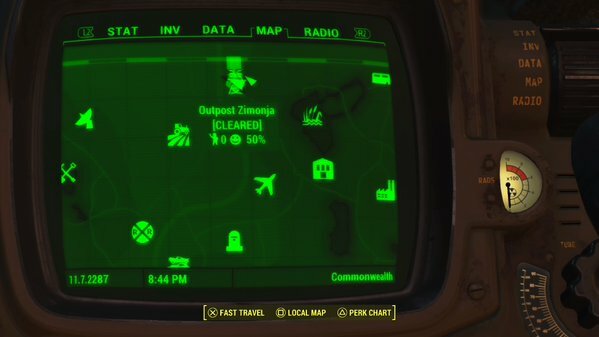 You can find it on your own, or Preston may call upon you to clear the Outpost in order to set it up as a Minutemen settlement. Go for a frontal assault - though do it from the side. Engage the enemy from the eastern bluffs and shoot down into the camp. This will make it easier to target them, give you more cover, and make it harder for the Power Armor dude to hit you with his Fat Man. Grenades are great, particularly when damaging the leader. Zimonja is condensed enough that you can take out most of it in stealth mode. Approach, again, from the east, and drop down into the camp from the bluffs. Use Sneak Attacks to wipe out the handful of defenders. The leader will be trickier, and can murder you good if you get caught, but he has enough gaps in his Power Armor (like, you know, his head) to give you some easy targets. You can also snipe from the bluffs, whether you’re noisy or quiet. Again, aim for heads. Regardless of how you wipe out the Raiders, the Outpost is now yours. Huzzah! Have a look around for items, including an Astoundingly Awesome Tales that’s sitting on the Workbench. Considering you already have power, make a Recruitment Radio Beacon your first priority. You may need to outsource elsewhere to get the parts. Though there’s some food and water, the Outpost is pretty short on resources. Get more plants and Pumps up and running. Defensively, despite the frontal emplacements, the Outpost is somewhat exposed on its flanks. One of the beds can be flanked, considering it’s open to the rock face you probably scaled to get down here in the first place. Centralize the sleep arrangements and set up some less threadbare - and possibly taller - structures to better protect your citizens. It’s way too easy for baddies to shoot from the rocks if they decide to spawn up there.